Here's my card for this week's My Favorite Things Wednesday Sketch Challenge. I used the Monster Love set again for this simple child-friendly design. 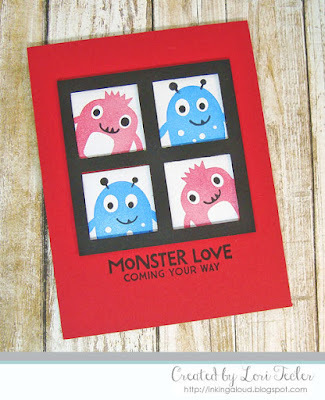 I stamped up four monsters on white cardstock squares using red, blue, and black pigment inks. The squares were arranged on a red card base, then framed with a black square with "windows" cut out of it using a square punch. The frame was attached to the card base with foam tape to give it dimension. The set's "monster love coming your way" sentiment was stamped just beneath the frame to finish the card.